The All Natural Solution For Your Hotel. Introducing The Hospitality Collection. Designed specifically for the Hospitality Industry. All the materials in our Sleep On Green mattresses are a microcosm onto their own, with special qualities and benefits, similar yet distinct. These elements, in its entirety, are greater than the sum of its parts, they collaborate, and create a union to perfectly support our mission to provide the best product to better one’s health and life through sleep. What sets us apart from the rest is the dedication to provide the best quality products that work in conjunction. Nothing is better than what Mother Nature offers us. The best products come from nature, no chemical’s, no harsh detergents, no impact on the environment. Natural latex, durable, hypoallergenic pillows. Lasts 3X longer than conventional pillows. Happy Goose filled duvet. Lightness and softness in a work of art. OEKOTEX Certificate. This mattress topper is made of soft cotton fiber and guaranteed by its stitched construction that the filling does not shift from one square to another. Washable by instructions. With over 10 years of research and development, we have created a mattress that is the healthiest alternative to the chemical ridden beds available on the market. Not only does our Sleep On Green mattress system benefit your health, it also helps your wallet and the environment. According to the AH&LA, US, hotels will replace 700,000 beds and generate close to 33.6 million cubic feet of solid waste in the process. The equivalent of throwing money on a landfill. Exceptional material’s and craftsmanship are a few of the many factors that make our mattresses prevail above the rest. Hotel mattresses are in a perpetual loop of use, day in and day out, this makes durability paramount. Due to the construction and materials used, our mattresses life expectancy exceeds that of ordinary beds by three fold. The ingredients used, such as the coconut fiber, have a rubbery cellular structure does not lose its form like spring and coil beds do. The layered strata that form the mattress are completely removable and if parts are deemed as worn they can easily be replaced with new material. This interchangeable ability cost a fraction of what it would cost to replace a bed in its entirety. This will reduce the cost of ownership by at least 50%. The backbone of the mattress as previously mentioned is the coconut fiber. This sustainably sourced material is supportive due to vulcanization and sterilization, resembling lattice strands. This thick layer can be placed closer to the surface for firmer beds or with latex layers above for a softer surface. The supportive benefits help people sleep longer and better. Patron safety is of the utmost importance, fires are a real danger and this can be done without chemicals. Our mattress is covered in a 100% natural textile that is fire resistant in combination with natural wool. The fiber structure of wool is naturally fire resistant and high in nitrogen and water content which creates a kind of barrier. Fire requires more oxygen from the environment, in a sense snuffing out the flame before it can really form. This is called a high Limiting Oxygen Index. Another benefit is that wool does not melt, smoke, drip or stick to skin. It will only burn in extremely high fire heat situations of 570-600°C which is around 1112F. Tired guests may forget to extinguish a cigarette, causing havoc, but if the flame never forms, the patron and the hotel stay safe. 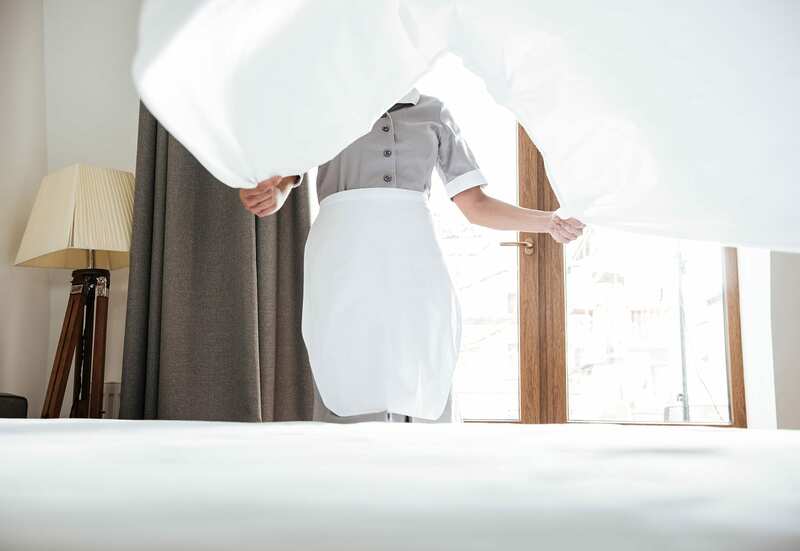 With the constant use of mattresses in hotels one of the fears is that there will be a bed bug outbreak. The heat and moisture management that wool, latex, coconut, and cotton provides acts as a deterrent for bed bugs from creating a home in your mattress. The clean environment becomes inhospitable. Bed bugs thrive in heat and grime. The wicking properties, anti-bacterial effects, and breathability act as the natural barrier against bed bugs. Asthma and Allergies strike one out of five Americans. Our materials are naturally hypoallergenic. This is beneficial for visitors traveling from different countries, not accustomed to the new environments. Due to the effective moisture management that our natural materials provide, it’s a natural anti-bacterial environment. This reduces the odor caused during sleep. Since wool dissipates moisture so well, bacteria do not have a warm damp environment to live and propagate. Rubber is another element that fights bacteria, the reason that rubber trees produce latex is as a natural defense against insects, it also fights mildew and mold. Our mattresses are essentially maintenance free. The cover is removable and easy to dry clean. The coconut fiber layer is washable simply with water and dries fast. Natural latex can be air dried if needed. All the elements work together to provide the best product for the best nights sleep ensuring customer satisfaction.